If the below doesn't appeal there's the weekly foosball tournament at The Green Briar. It's $5 to enter; I mentioned it last month. A Showtime series with William H. Macy would pique my interest, but the commercials/previews haven't excited me. They were making people RSVP, but I got an email saying no passes are required for tonight's preview screening -- seating is first come, first served. Check-in will begin at 6:00pm with the show starting at 7:00pm. Guests will receive a Medium popcorn and fountain drink, compliments of Showtime. I think I would rather watch the original British series. Director Nathan Wrann in attendance. The impressive horror source All Things Horror usually presents an ongoing indie-horror film fest on the first Wednesday of the month. I think I've been sleeping on this one for a couple months, but they're still at it. Tonight's feature sounds like a tense black-and-white thriller that will benefit from the director being in attendance. I assume he'll answer some questions from the audience afterward. Yeah, it's tough to be an independent business even in the best of times. Music/book store Diskovery moved from Allston to Oak Square a couple years ago to reduce their rent, but that wasn't enough. If you'd like to help keep them open, you can dig the punk show tonight. There will also be handmade crafts and baked goods for sale with the proceeds going to keep the store afloat. Jordan Valentine & the Sunday Saints is bringing down the house on the first Wednesday with a couple sets of big, honking old-school soul and R&B at the Milky Way. After Kimon Kirk opens up, he'll play in Amy's band on bass for what should be a great set of exquisite husky-voiced folk-rock. Some of Doomstar! guys are doing this monthly night where they play old soul and psych records while inviting people to perform live. 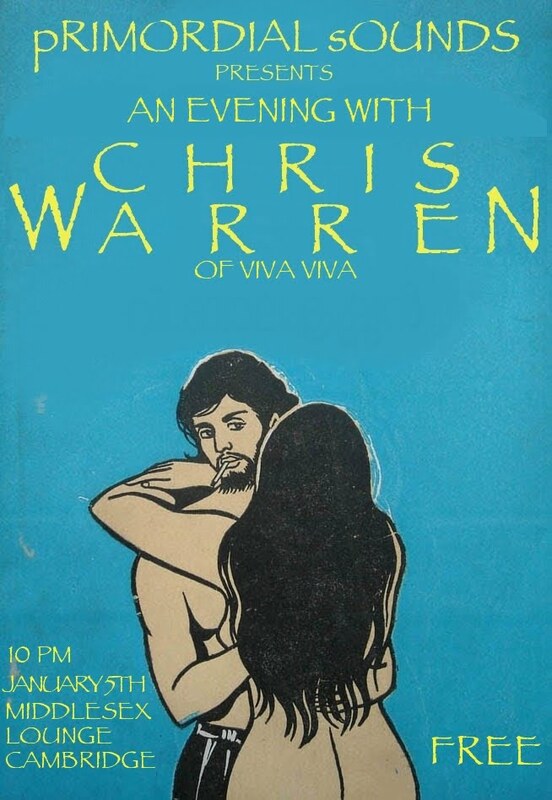 Chris Warren of the excellent Viva Viva will play solo and with a drummer. It looks like "pRIMORDIAL sOUNDS" aren't updating the blog, so you can check Facebook for current info. I appreciate all that you do on this site, but I was wondering if you could post events the day before they happen? I've found that it's always too late for me to visit most of these because I work til 6 and by the time I get to my RSS feeds everything has either started or ended. If I saw today's events yesterday I could have planned to go from work. Please let me know what you think, and no ill will! I normally don't make resolutions, but it's been my goal to get back to posting in advance. Today didn't happen. I'll try for weekend cheapness tonight, and I will have consistent advance posts by this time next week.